The term "slab" is slang for a type of holder that third-party grading services use after they professionally authenticate and grade your coin. There are many advantages to submitting your coins to third-party grading services. One of the top reasons that you should use a third-party grading service is that your coin will be housed in the best and most durable coin holder that money can buy. Third-party grading services started in the late 1970s and early 1980s to provide a professional numismatic opinion of a coin's grade and guaranteeing authenticity. During this time many investors began to realize the potential for investing in rare coins. Coin prices were generally on the rise during this time, and this appealed to many investors. Unfortunately, many people started calling themselves "coin dealers" and were selling over graded coins at exorbitant prices to people who are unfamiliar with coin collecting and grading practices. Third-party grading services hire expert numismatists that examine every coin for its authenticity and provides their expert opinion as to the coin's overall grade. The service then seals the coin into a transparent plastic holder that protects it from environmental and physical damage. These holders will not damage the coin since it is suspended within the holder using an inert plastic insert. Additionally, you cannot remove the coin from the holder without damaging or destroying the holder. The advent of third-party grading services brought stability to the coin collecting market, especially for rare and expensive coins. No longer were buyers dependent upon an opinion from the same party that is selling the coin. Now a third party, which has no vested interest in the transaction, can provide a professional and unbiased opinion as to coin's grade and hence its value. Additionally, counterfeit coins were more easily detected and removed from the marketplace. Slab holders are specially constructed to store rare and expensive coin for extended periods of time. The inert plastic insert which comes in contact with the coin's edge is engineered explicitly so it will not react with the coin's metal. This includes damage from physically coming in contact with the coin and making sure that the plastic insert does not emit any gasses that would cause discoloration or corrosion on the coin's surface. The outer housing is made from clear hard plastic. Although this plastic does not directly come in contact with the coin's surface, it is also made out of inert material that will not emit gases or in any way react with the coins metal surface. Additionally, they have constructed the outer plastic housing out of high-quality plastic that is optically clear and will not discolor over time. Finally, they place a label indicating the coin's denomination, year of minting, other identifying characteristics and the professional numismatist's opinion of the coin's grade inside the coin holder. The coin is then sonically sealed which provides a virtually airtight closure between the upper and lower pieces of the outer house. Any effort to remove the coin or tamper with the indicated grade would become evident on the coin's holder. 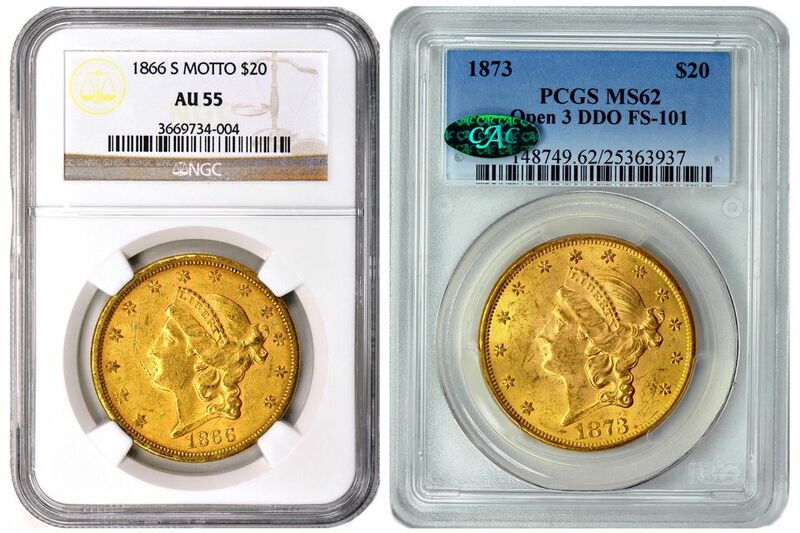 Experts highly recommended that any valuable or rare coins be submitted to one of the top-tier third-party grading services (PCGS, NGC, ANACS). In addition to getting a professional numismatists opinion of the coin's grade and authenticity, you also receive the highest quality holder to protect your coin. Remember, the slightest fingerprint could reduce the value of a rare coin. Most importantly these holders protect against physical damage if the coin is dropped unprotected onto a hard surface. The primary disadvantage to having your coins slabbed is the cost. Costs range from $10 to $30, or more, to submit a coin to a third-party professional coin grading service. But the value that you receive back can be priceless. Finally, when it comes time to sell your coins, by yourself or by your heirs, there will be no doubt as to how to determine the value of a coin based upon its type and grade as determined by a professional numismatist. Although this is the best way to protect individual coins, you must remember there are additional steps that must be taken to protect, preserve, and store your entire coin collection. 7 Things You Should Never Do to Your Coins!